The heart of Gdansk, and the area where you'll probably want to kick off your adventures, is the magnificent Dluga street (Long Street), which gives way onto Dlugi Targ (Long Market) in the east. With its tall, gabled merchants houses, adorned here and there by ornate decorative flourishes, the district has a distinctly Dutch air about it. This was indeed one of the great Hanseatic cities, and post-war conservators have done a marvellous job in recreating the splendour of old Gdansk (the claim that it is difficult to tell where new elements fuse with the old is often true). Like so many of Poland's great cities, Gdansk had its own Royal Way for state processions. This began at the monumental Upland Gate (Brama Wyznna), and continued through the splendid Golden Gate (which today is a rather fetching shade of blue). You can follow this route down Dluga street and on into the splendid Dlugi Targ, passing on your left the magnificent Town Hall, and the mythical Arthur's Court, (the interiors here are original and well worth a look). Heading north from the Town Hall is the formidable Kosciol Mariacki (St. Mary's Church) which is reputedly the largest brick church in Europe, and it's certainly the largest church in Poland. Founded in 1245 and completely regenerated during the fifteenth century, it was the only major building to come through the war unscathed. Just over the road, you'll find the exquisite little Royal Chapel, which was built in 1678 by one of the finest architects to have worked in Poland, Tylman van Gameran, or Gamerski as he was known to the Poles. To the east of the main town you'll find the Stare Miasto (Old Town), which saw less attention by post-war conservators. Today it offers a mix of historic and modern buildings - fans of gothic architecture will enjoy the church of St. Catherine's. Also worth a look is the newly opened Baltic Cultural Centre, which is housed in the old renaissance Town Hall. An area of Gdansk that is certainly not conventionally attractive, but nevertheless of considerable historic resonance, is Stocznia Gdansk - the Gdansk shipyards. These monumental relics of the Soviet era (which were called the Lenin shipyards until the late 80's) were the surprise crucible for the Solidarity protest movement of the early 80's. Solidarity's irrepressible leader, the moustachioed Lech Walesa, eventually took the mantle of President in 1990. History buffs may well feel inspired to press on further north to Westerplatte, the waterside promontory that saw the first shots of World War II. A small Polish garrison held out here for six days amidst bombardment from all quarters. Two further gems for culture vultures are the well-endowed National Museum, which can be found in the Old Suburb, and the splendid cathedral of Oliwa, which is one of the finest buildings in the city. After all that culture, you may feel inspired to let your hair down a bit. Gdansk can be very quiet in winter, in which case the bright lights of Sopot may do the trick. It's a twenty-five minute jaunt by rail. 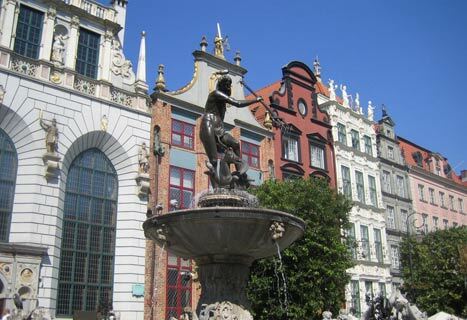 I am visiting Gdansk for the first time in June/July. I wish to visit the towns just south of Gdansk - these towns are mentioned on death certificates of my G Grandfather and his parents also came to Australia in 1873 and all are buried here. I am looking forward to just seeing where they came from although I had never met them. I am wanting to obtain some birth certificates and a marriage certificate before I go over there - has anyone any clues. I have been on Google for days now and have learned much. The name changes of the towns creates a tangle in the brain. Does anyone have any clues as to the public transport system? Bus I believe is the best way.......I am concerned about the amount of English that may not be used out of the main cities. Kerlin is the family name! Visiting Gdansk for first time this September. This is a response to Tracy's comments of Oct 2009. My great-great grandfather was born in Danzig 1838 and lived in Swansea, Wales where his descendants have lived since. He was a shipwright and had the name John Wright. It's possible that he could be Theodor Schweitzer with a changed name? Tracy if you have any information about our possible shared ancestor that would be appreciated. Gdansk is beautiful. Be warned though alot of things are closed in Winter season. Things start to re-open in April/May. There is still plenty to do, mainly eating and drinking!!! We had a great time. Learn some polish phrases especialy "2 bus tickets please". Gorgeous city!!! I'm so glad my husband took me to his city and showed me around!!! your comments as well the photos brought back fond memories of my time in Poland. I lived in Warsaw for 5 months during a work assignment and traveled to Gdansk as well as other wonderful cities in Poland. Thank you for reminding me of how beautiful and wonderful the towns and cities are until I am able to return with friends.